Are you fed up of hearing that autumn is finally here yet? Ok, I won’t say it – but I’m definitely thinking it and I’m really excited about it. 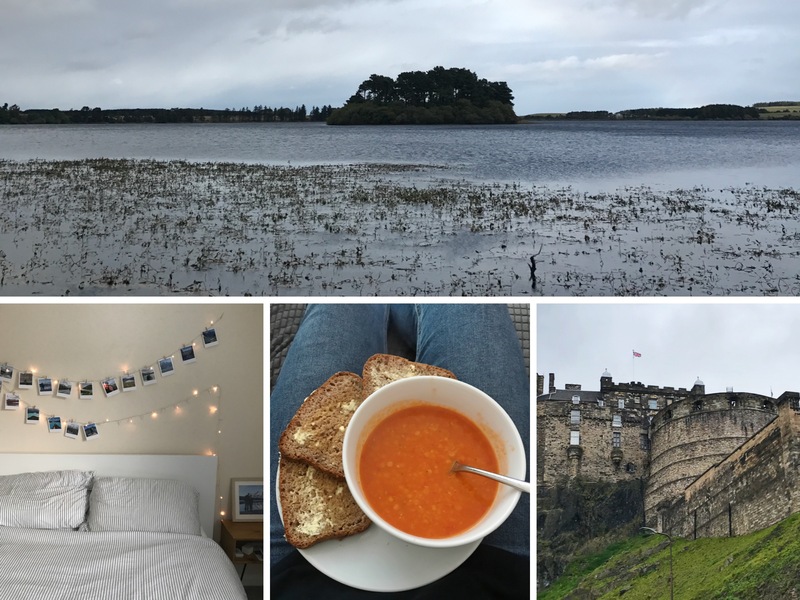 September was our first full month living in Edinburgh, and it’s been a great month. We’re getting our bearings, are loving living here, work is good, and my masters is equal parts fascinating and horrifying. NB: we’re fudging the planet big time and need to stop being dicks to it. In September, I decided to give being fully vegan another go and it’s going really well so far. We’ve made some delicious vegan food, like soup and butternut squash “mac n cheese”. I found Maria’s blog towards the end of September and it fast became a favourite. Maria covers a range of topics, such as vegan food and recipes, anxiety, and overcoming exercise addiction to name a few. What drew me to her blog was how absolutely honest it feels. It feels like you’re talking to her in person. She isn’t trying to be someone else at all. My favourite blog post from September was her top 10 vegan pantry essentials. 10 plastic items you can give up right now | Airplanes and Avocados – See my earlier note about us screwing up our planet big time. I have a serious issue with plastic pollution. Here are a handful of plastic things you can give up right this second and make a change. Autumn lust (25 reasons why it’s my fave) | Immy May – Baby, I’m sorry, not sorry. I love autumn and I love fellow bloggers who fangirl about the best season. Sometimes it’s ok to be selfish | Blogilates – We often feel bad, or are made to feel bad, about being selfish and taking time for ourselves. Sometimes we need it badly because without it, we can’t function the way we want to, chase or dreams, or love the way we want to. Should vegans keep pets? | Not So Quiet Grrl – It wouldn’t be a Share The Love post without sharing something of Nadia’s. As you might have guessed, this is a really interesting debate about whether or not vegans should keep pets and is well worth a read. Vegan buckwheat waffles | Choosing Chia – I haven’t had chance to make these yet for myself but there’s no way I wasn’t going to share these. September was an amazing month for new music. LIGHTS’ new album, Skin & Earth came out and it is just as beautiful as everything else she’s ever released. Shania Twain dropped her first album in 15 years and it is wonderful. Taylor Swift’s Red album is always a popular listen in autumn because it always given me autumn feels. I brought Avril Lavigne’s first two albums on vinyl and they’ve been getting a fair few plays. Don’t lie, we all had an Avril phase. Oh Wonder’s Ultralife is a chilled, cosy album to listen to as the nights are drawing in. Miley Cyrus’ new album, Younger Now, is also worth a listen. I’ve been seriously into podcasts on the way to and from university. My absolute favourite is From Earth To Us, closely followed by Estee Lalonde’s The Heart Of It. Our TV signal is rubbish where we live, so Daz and I have been watching a lot of Friends re-runs and documentaries on Netflix / iPlayer. We really enjoyed BBC’s Life at the Extreme, Chasing Coral (it’s a hard watch), and being the Canadaphiles we are, we chuckled hard at Being Canadian. Like most of the UK, we are pretty undecided on our feelings towards Channel 4’s Great British Bake Off. On one hand, it’s a baking show; what isn’t to love. On the other hand, it belongs on BBC and WHERE’S IS MARY BERRY?! At least it isn’t as bad as the reboot of Top Gear. Trying out Antipodes – are their products worth the hype? What did you enjoy in September?